If you're considering a new phone to bring to Tracfone's BYOP program, you may want to consider the new Moto G5 Plus which is now available for pre-order. The Moto G line of smartphones is a popular choice for Tracfone users. They are versatile, budget friendly devices that pack in great performance too. We recently shared our review of the Moto G4, a great option to use with BYOP because of the capability to activate it as either a GSM or CDMA device, among other strengths. Now we have news about the upcoming Moto G5 and G5 Plus. So if you're curious about the next generation of Moto G phones, keep reading. A number of images and information about the Moto G5 was leaked in the weeks prior to the official announcement, and some of that information has been not quite accurate. However, with the G5 and G5 Plus officially announced at the end of February 2017, we now know full details on these new smartphones. Only the Moto G5 Plus will be available in the US, and it is available for pre-order from several online sources including Amazon and Bestbuy. Full release of the G5 Plus is expected at the end of March. Now let's look at what everyone is interested in, the specs for the new Moto G5. The new Moto G5 Plus has a lot of great features packed into a compact frame. It is a solid step up from the G4, with only a small price increase. The Moto G5 Plus has a 5.2" full HD screen. This is smaller than the G4, which had a 5.5" screen. Both phones have 1920x1080 resolution and the G5 Plus has Gorilla Glass 3. There are two versions of the G5 Plus available, one with 2 GB RAM and 32 GB memory, the other with 4 GB RAM and 64 GB memory. Both versions use the fast, 2.0 Ghz Snapdragon 625 octa core processor. Let's take a look at the full specs on the G5 Plus to see all it has to offer. 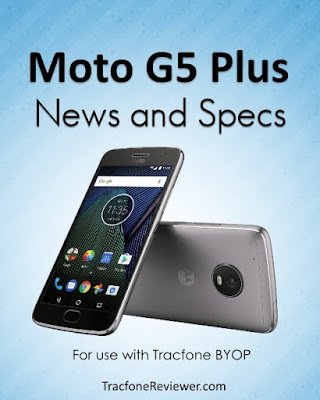 The G5 Plus is a well-rounded phone, with powerful processor, great camera, and lots of connectivity options. For photo and video needs, the G5 Plus has a 12 MP rear camera with dual auto-focus technology which means faster and more accurate focusing capabilities and 5 MP front camera. You also get full metal construction, which gives them a high-end feel and appearance. The Moto G5 Plus is available in the US, with two memory/RAM combinations. Starting price will be $229, with the higher RAM/Memory option coming in at $299 (this is $50 less than the G4 Plus with same options) and it will come unlocked and ready to use on any of the major carriers (Sprint, Verizon, T-Mobile and AT&T). Based on these specs, the Moto G5 Plus looks very attractive as a solid performer for the smartphone enthusiast. It has all the capabilities to keep up with daily demands. We will update with full details as soon as more becomes clear, but this new phone sure looks impressive. Keep up with the latest posts, news and deals by joining us on Facebook. We also have a YouTube channel where we hope to provide additional content in the coming months. leave a comment with your thoughts or questions about this new phone. Take a look at our Guide to Activating a smartphone with Tracfone BYOP if you have questions, or visit our List of the Best Unlocked Smartphones for more buying options. 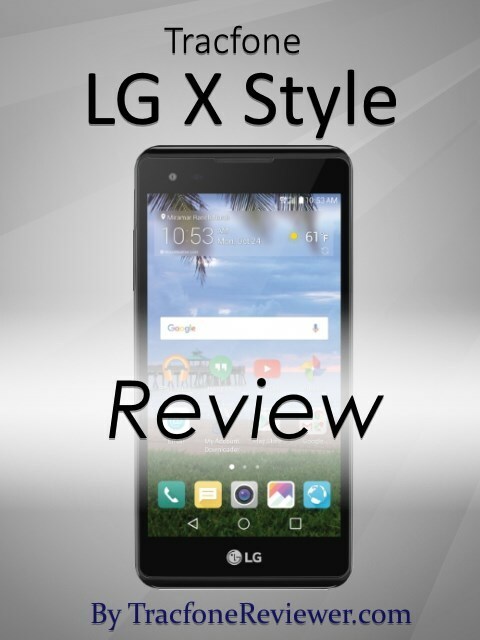 And we just reviewed the LG X Style which has some great features for the price, so check it out if you're shopping for a new phone. 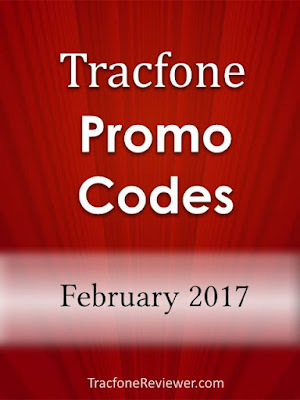 Welcome to TracfoneReviewer, your source for Tracfone related news, reviews, information and promo codes! 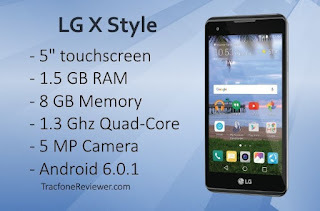 The LG X Style is a recently released (early 2017) Android powered smartphone with 5" touchscreen, Android 6.0, and 4G LTE capability with Tracfone Wireless service. 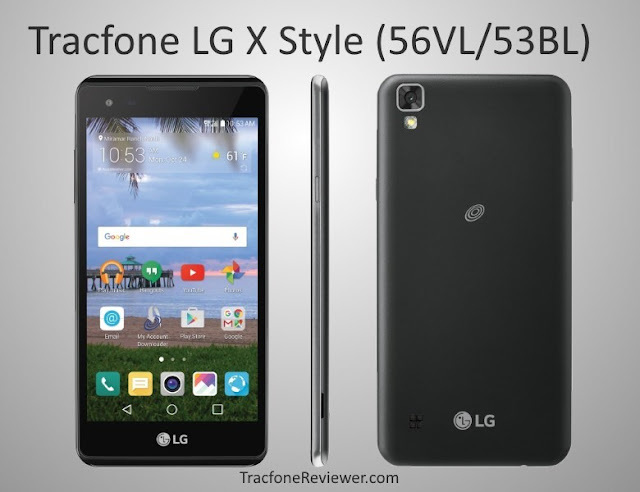 In this review you will find full specs and features for the X Style, pro's and con's, and comparison to other Tracfone smartphones. This device is another smartphone in a growing list offered by Tracfone that feature Android 6.0 Marshmallow. The Samsung Galaxy Sky and Samsung Galaxy Luna are two other smartphone options, which we will compare to the X Style further along. A newer Android OS such as 6.0 means less vulnerabilities and newer features. The LG X Style is an exciting blend of good specs and a small, sleek body that make it seem more expensive than it is, at just over $100. One of the drawbacks for this device is the lack of internal memory, with just 8 GB. The low internal memory may be a deal breaker for many, who need the space for storing apps, photos, videos and music. But the X Style does have a Micro SD card slot for extra storage. Of course, for those looking for more internal memory, the best options might be bringing an unlocked smartphone to the BYOP program. There are a number of great smartphones with 16 or sometimes 32 GB memory available for $200 or less. Visit our list of the Best Unlocked Smartphones for Tracfone BYOP to learn more about these options. With any budget smartphone, the manufacturer has to balance performance with price. Has LG got this one right? We shall find out in this review. Let's begin with the full list of Features and specs. Please note that there are two versions of this phone, one uses CDMA service while the other uses GSM. Currently the CDMA (LG L56VL) version is the only available device. Size: 5.70" x 2.81" x 0.27"
A removable batter is a popular feature for some, and the X Style allows that. Also notice that there is a GSM and CDMA version of the phone, so be sure to choose the device that is right for your location. The X Style comes with Triple Minutes for Life (as do all smartphones from Tracfone) but that only applies to regular airtime cards. We recently shared the Best Deal on Tracfone Airtime (using Auto-Refill) so take a look if you want the best deal on minutes. Is your smartphone slow or does it lag when you try to open apps? This is usually caused by a lack of power from the processor or RAM. The LG X Style brings 1.5 GB RAM, and a 1.3 Ghz quad core processor that are a nice combination for keeping this phone fast and smooth. By comparison to many mid to high-end phones, this isn't a lot (the Moto G4, for example, has an octa-core processor and 2 GB RAM). But compared to older Tracfone devices, this is a good improvement. Only a small number of Tracfone smartphones have 1.5 GB RAM, most only come with 1 GB RAM (or less). The exterior of the X Style is likely the biggest selling point (hence, the name). Despite the plastic construction, the phone looks and feels like a much more expensive device. It is thinner than many smartphones, including the iPhone 6S, and the 5" HD touchscreen has Gorilla Glass 3 protection for extra durability. There are a lot of extra features on this phone that make it a viable upgrade for those in the market. It is a step in the right direction compared to some of the other recent LG phones, such as the Rebel and Treasure, which didn't 'wow' in any particular way. But let's look at a few negative aspects about the X Style before we conclude. There are two main drawbacks about the LG X Style that the average consumer would want to know, and that is the lack of internal memory, and the low-res rear camera. We've already mentioned the low internal storage on the X Style. It comes with 8 GB of total space, but the operating system and pre-installed apps take up around 5 GB, leaving you with only 3 GB for apps, pictures, music and anything else. For consumers who only use a small handful of apps anyway, this likely won't be a big deal, and the option of up to 32 GB external storage via a Micro SD Card is a nice possibility. On some Android 6.0 smartphones, the external storage can be treated like internal storage, allowing significant expansion of the on board memory. We have not tested this on the X Style yet, but this feature did not work on the Samsung Galaxy Sky, which uses Android 6.0. More details coming soon on this. The 5 MP rear camera on the LG X Style is fairly standard on a phone in this price range. We would have liked to see something more advanced, perhaps an improved 8 or even 12 MP camera would have grabbed more attention, although storage would have been an issue. In the end, the 5 MP rear camera is fairly good for what it is, and has a variety of features including full HD photos, HD video, panorama, voice control, and a handful of additional features for both the rear and front facing camera. That concludes our key pro's and con's for the X Style. It is a sleek, and well designed phone, but doesn't excel or surprise in any areas. If you are considering a new Tracfone device, the X Style and Galaxy Sky are fairly similar smartphones released about the same time by Tracfone. They share a number of similarities, including screen size, Android 6.0, 1.5 GB RAM, and more. But they also have a few differences. The Galaxy Sky has 16 GB internal memory, while the X Style only has 8. The Galaxy Sky also has longer battery life. The X Style has a slightly faster processor, is thinner, and has a 5 MP front camera compared to only 2 MP in the Sky. These phones are very similar, but for many the deciding factor will probably be the internal memory, or the price (both phones have been available for $99 with airtime bundle). 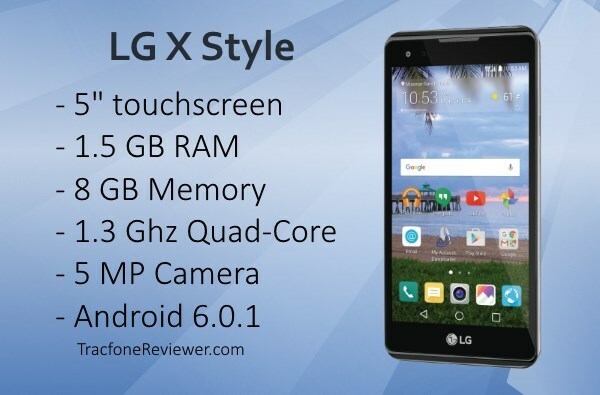 The X Style surpasses other LG phones like the Rebel, Treasure, Sunset and Ultimate 2 with newer Android OS, faster processor and more RAM, and a few other improvements, but none of the advances are major breakthroughs. Overall the X Style is a phone that feels like a high-end device in some ways, and has some great features, but also lacks the storage space many will need. For covers or cases, we found a number of options on Amazon. Take a look the interactive tutorial for additional information. Leave a comment with your thoughts or questions. We created a Guide to Activating or Transferring a Tracfone Smartphone with step by step information to help anyone with questions about the process. And you may want to see Four Ways to Check your Tracfone Airtime on a Smartphone which is one of our most popular posts. Don't forget the Promo Codes! Here are the latest Tracfone Promo Codes. While they are not meant to work on smartphones, it is worth a try as sometimes they do work. 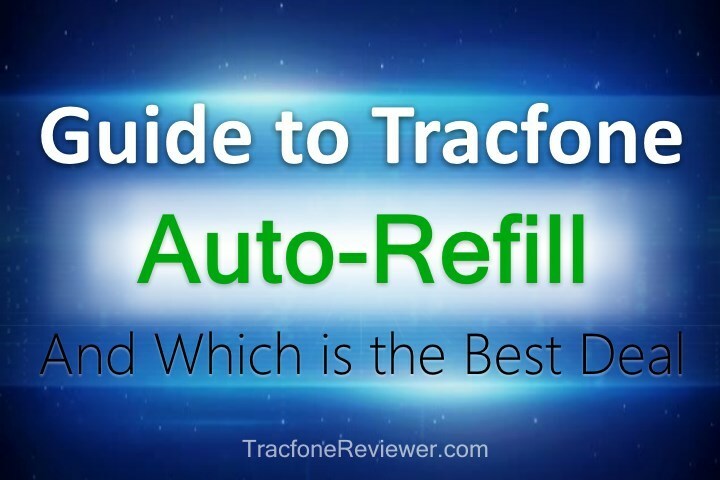 How do Auto-refill plans work, and What is the Best Deal on Tracfone Airtime? Welcome to TracfoneReviewer, we share lots of information including reviews, news and promo codes, so take a look around if you're new here! Everyone that uses Tracfone knows you have to keep track of how many minutes or service days you have left. And while some of us enjoy checking our airtime and topping it off when low, many would rather have a more 'hands-off' approach. On Smartphones, your airtime balance isn't automatically displayed on your phone, so it can be a little harder to keep track of your talk, text and data. Fortunately, Tracfone offers several options for automatically refilling your airtime, and we are going to cover how it works, and which options are best for you. What is great about these auto-refill options is that they also come at a small discount from regular airtime cards, making them a better deal. But which one is the best deal? We share that, and more, below! Tracfone Auto-Refill - Various airtime cards that are automatically added to your account at regular intervals depending on the card you choose. Up to 10% discount on regular price. Tracfone Value Plans - Monthly minutes(50, 125, or 200) and service days added to your account. The Value Plans have been available for a while, and triple on all smartphones. The Auto Refill is just various airtime cards, including both regular and smartphone-only cards, that Tracfone adds to your account automatically at a small discount (usually 5-10%). From this table you can see the variety of auto-refill options along with the Value Plans. Notice that the Value Plans all give 30 service days, while the auto-refill plans vary from 30 days, to 365 days, depending on the airtime card. -Follow the prompts which allow you to choose from several options. But which auto-refill option is best? Keep reading to find out! 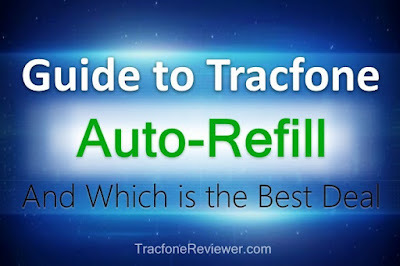 What is the Best Auto-Refill Plan from Tracfone? Scenario 2: You have lots of service days, but are low on minutes (talk, text or data). What you need is the best deal on minutes. Now let's see the next table, which shows the monthly cost, along with monthly airtime amounts. From the table above you can see how much each plan costs per month, and how much talk, text or data you get. The 60 Minute Card is the clear winner for cheapest monthly plan. If you're in scenario 1, you will probably want to choose this option. But what is the best deal on minutes? For that, we calculated the cost per minute (per month) for each auto-refill option. Taking a look at the numbers in the table below, we see that the 500 Minute Smartphone Only airtime card is the cheapest in terms of cost per minute of talk time (once all other costs are factored out) at just 1.08 cents per talk minute! Notice that the 750 Minute Smartphone Only card is the next best value, followed by the 60 Minute regular card. Here is a graph for those who would rather see a visual representation of the numbers. Notice that the 1500 Minute Smartphone Only card is the worst value. For the majority of Tracfone users who have smartphones, the 500 Minute Smartphone Only auto-refill is the best choice. If you need additional airtime, buying a text, data or extra airtime card is easy to do. If you find yourself with too many minutes, switching to the 60 Minute Card will save you money. We hope this information is helpful and accurate, be sure to let us know your thoughts in the comments below, and if we made any mistakes. Join us on Facebook where we have a great community of users, and share the latest news and information. Take a look at our updated list of Tracfone Promo Codes if you're adding airtime to your phone anytime soon. Visit the List of Latest Tracfone Smartphones (2017) to see what's new for this year. And finally, learn what we Expect from Tracfone in 2017 including new phones, and improvements in customer service. 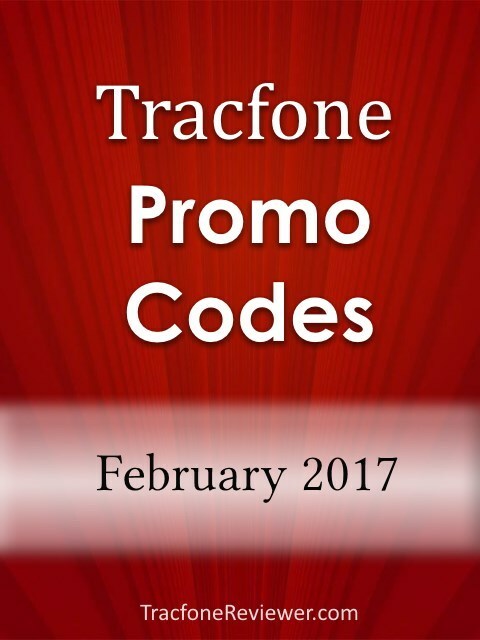 Each month we collect the latest Tracfone Codes and share them freely here on our site. These codes can be used to get bonus minutes from Tracfone when you add an airtime card. These coupon codes are meant to be used with a certain airtime card, but can be also used with any card of greater value. For example, the code for a 60 Minute card can also be used on the 120, 200 and 450 Minute cards. Some codes may be used several times, while others can only be used once. If you run into problems where a code didn't get you any bonus minutes, we suggest contacting Tracfone. Tracfone promo codes are not supposed to work on Android or apple smartphones, however several of our readers can confirm that they do occasionally work. The codes below are the latest, and updated for February 2017. We also have many more codes to try on our main Tracfone Promo Code page. Be sure to also take a look at our List of Latest Phones from Tracfone (2017) where we will continue to update any new phones released by Tracfone this year. Some codes are single use, while others can be used multiple times. If you want to ensure that you get the bonus minutes, we suggest adding the airtime over the phone. That concludes our list of codes for February 2017. We hope these codes work for you, and drop a comment below with your feedback! Airtime cards are available from many stores and online. You can also find them on eBay , where you might be able to avoid certain taxes. See some great deals and discounts on Tracfone Devices and Minutes in our recent post! And if you haven't already, find out what we think the future holds for Tracfone in 2017!